Provisioning for a recent trip out of Camden Maine, the local market was selling bacon brownies in the bakery. At a county fair, I found a vendor selling bacon strips dipped in melted chocolate. If this surprises you, then you’re out of the chocolate loop. The bacon-chocolate craze has been taking off like a banshee. The combination of crisp salty-smoky bacon and the subtle-sweet smoothness of chocolate is an incredible contrast in tastes. 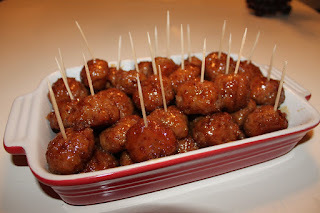 This recipe is one of my all-time favorites and it will be yours too. An important note: Be sure to use real bacon bits, not imitation bacon bits. Also, you can make your own bacon bits in a food processor; make sure you pat down the bacon with paper towels to remove as much bacon grease as possible. Beat together the butter, sugars, flavorings and eggs until creamy. Add in chocolate chips and bacon bits. Stir until well integrated. Wrap dough on a sheet of waxed paper and refrigerate at least an hour. Remove dough from fridge, pinch off 1½ inch pieces of dough and roll into balls. Set dough balls about 2 inches apart on an ungreased cookie sheet. Flatten dough balls slightly with your fingers in the center. Bake the cookies for about 10 minutes or until the dough starts to turn golden brown. Allow cookies to cool on a cooling rack while you make the glaze. Enough water to make a thick glaze. 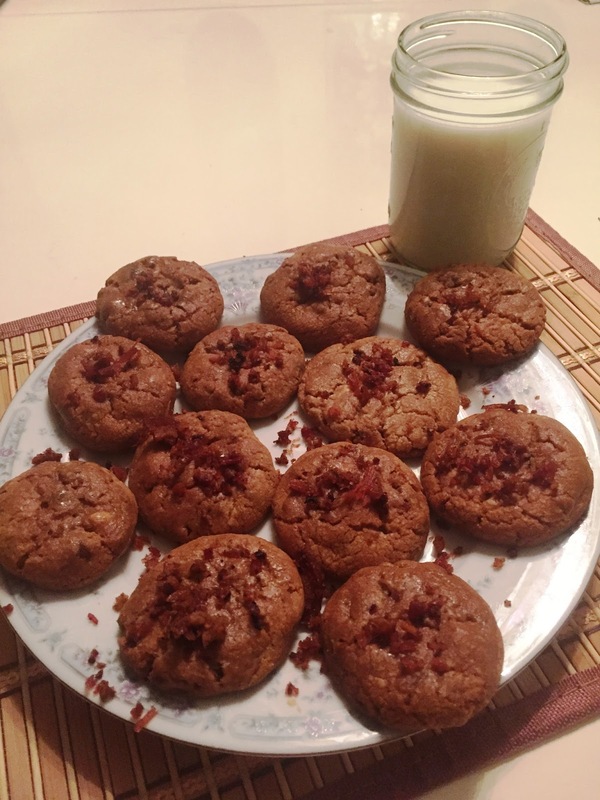 Spread a small amount of the glaze on the top of each cookie and top with leftover bacon bits. In 1989, I delivered a 54 Bertram from Hong Kong to Guam and stayed for a year and a half to start the owner’s charter fishing operation. While there, I attended an outdoor Maxi Priest concert. Being 6’1 and heads and shoulders taller than most of the Chamarro people there, I spotted a tall blond fellow to whom I gravitated to. Steven Brownsea was an Australian captain who ran a Japanese sailing/racing syndicate and was on Guam as a stop-over en route to the U.S. west coast. We became instant friends. For the next 25 years, Steven and I have crossed wakes on occasion until he hung up his foul weather boots and took a full-time position on a 127 Crescent based in San Diego. So, it was with great pleasure that my old seadog of a friend would show up in South Florida recently with yacht and chef/wife in tow. This Easter, Steven and Heather invited me to a holiday brunch aboard the Crescent and I was assigned dessert. I chose a variation on the blackberry cobbler; that was a standard fare growing up in the Pacific Northwest. 1 cup turbinado (unrefined cane sugar) or granulated sugar. Heat oven to 400°F. Grease a 2 qt. casserole dish with spray shortening. In a 4 qt. skillet over medium heat mix the sugar and corn starch. As mixture starts to melt, add berries and lemon juice and toss until evenly coated. Heat to boiling (about 4 minutes). Stir constantly until mixture thickens slightly. Transfer mixture to casserole dish. In a large bowl, mix flour, brown sugar, baking powder, salt and nutmeg. Cut in butter using two crisscross knives until it looks like crumbles. Mix in enough warm water until it forms a soft dough. Drop the dough by the tablespoon full on top of the berry mixture. Since long ago, when the second person on earth mixed peppers and beef and cooked them together, the great debate began; who makes the best chili. Maybe it’s the effect of capisicum spices that makes chili cooks crazy. Some say chili originated on the cattle trails of west Texas in the early 19th century. Others tell the grisly tale of angry Aztecs, who cut up invading conquistadors, seasoned chunks of them with a passel chili peppers, and ate them. One thing is for certain, for Texans like myself, chili is not only an institution, its’ a matter of personal pride. First thing you will notice is that there are no beans in true Texas chili. In a 12 inch skillet, brown half of the meat until thoroughly cooked. Drain in colander and then transfer to a 5 quart slow cooker. Repeat with remaining meat. Add onions, garlic, jalapeño, tomato paste, tomatoes and sauce, broth, chili powder and cumin. Mix well and let cook for 8 hours (or overnight) on low heat setting. Pollo Pibil is a Mexican chicken dish from the Yucatan in which chicken is smothered with achiote paste and sour orange juice and slow cooked in banana leaves over hot wood coals in a hole in the ground. As we don’t have a hole to dig aboard, I slow roast the pibil in a crockpot. Achiote paste is a dark red paste made of ground annato seeds that can be found in Latin grocery stores that has a soft, earthy flavor, similar to saffron. 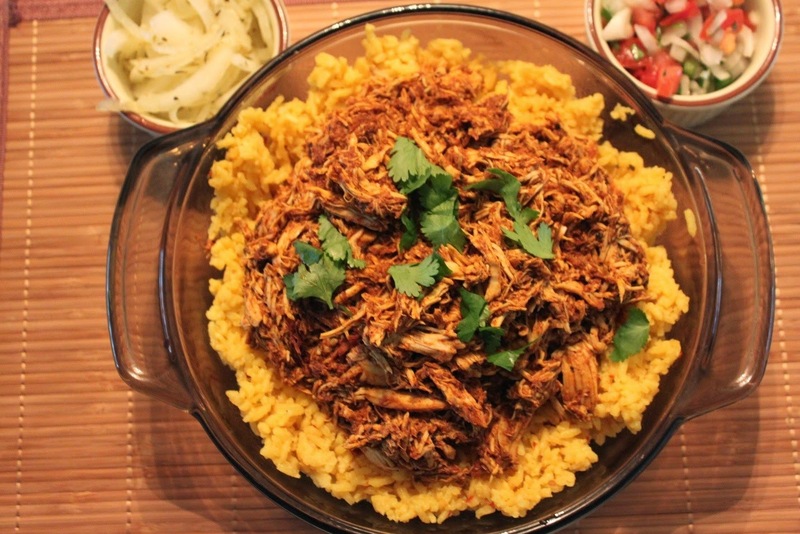 For this spin on a traditional Pollo Pibil, I use split chicken breasts (though thighs can be used for the budget cook) and slow cooked them in a delicious Achiote spiced sauce. Season the chicken with salt and pepper. Add to the crock pot. In a blender, combine the remaining ingredients to form the sauce. Pour over the chicken. Cook on low heat for 4-5 hours until the chicken can be easily shredded from the rib with a fork. Shred the chicken (discard rib bone) and let everything cook for 30 more minutes with the crock pot lid off. Leaving the lid off will help some of the water evaporate so the sauce thickens up. Just before the holidays, I went down to Panama to pick up a vintage 64 foot Burger to deliver back to Florida. An early winter delivery, there were my fair share of weather delays which allowed myself and the crew to explore Isla San Andres, Roatan and Isla Mujeres. Always on the scent for a new recipe, especially one where leftovers can be utilized. Salbute is a Yucatecan dish served on fried masa piled on with shredded meats like a chimichurri, chicken mojo, and taco meat or for the vegetarian, portobello mushroom and garnished with vegetables. This recipe requires a couple of easy preps but you will find it most rewarding. Combine masa and salt in a bowl and mix thoroughly. Slowly add warm water and mix with a spatula. Knead this dough on a flat surface until it becomes smooth; similar to the consistency of Silly Putty©. Use a small bit of oil on your hands to ensure the dough does not stick and roll a portions in your hands, about the size of golf balls. Set the masa balls aside for approximately 45 minutes. Once the masa has rested it is ready to be pressed into tortillas with a tortilla press (available at Bed Bath Beyond©, Williams Sonoma© or Sur le Table©) between two pieces of waxed paper. If you do not have either, you can cut the edges of a plastic bag and press dough on the counter top with a plate. They should be smaller and thicker than regular tortillas, about ¼ ″ thick and 2 ½ ″-3″ in diameter. In a deep skillet, fry them on both sides in hot oil. They will inflate as they cook. Flip over tortilla and cook other side and then drain in a colander lined with paper towels. Place onions in a saucepan, add water to cover, bring to a boil and then remove from heat. Drain and rinse in cold water to stop the cooking process. Place the onions in a glass container with the remaining ingredients and allow to sit for several hours before serving. This will keep up to one week in the refrigerator. Makes about 3 cups.